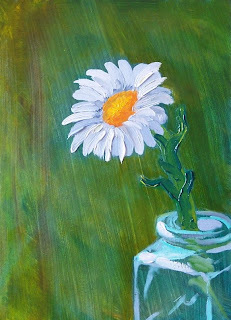 This painting is an 8 x 10 inch oil painting on gessoed hardboard. 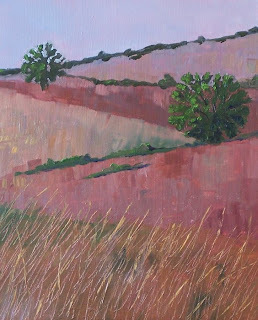 It was fun to paint these rolling prairie hills with their sparse greenery and minimal trees. 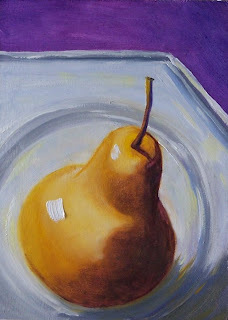 This painting is 5 x 7 oil on gessoboard. It is a brief glimpse across the grasslands of the Nisqually Delta between Olympia and Tacoma in Washington State. It is a beautiful natural habitat for numerous birds and wild creatures. Painting this 6 x 8 oil on canvas panel was a pleasure. It reminds me of the oak prairies that used to exist in the area where I grew up. Many of those prairies are now gone, replaced by "progress." 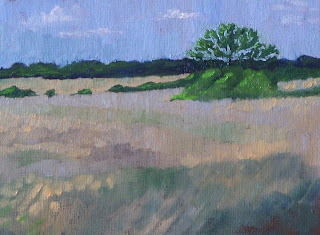 Yesterday morning I had fun painting this little 5 x 7 oil landscape on gessoed hardboard. 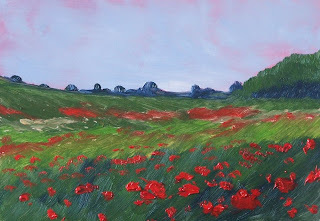 This is not strawberry fields forever, but it poppy fields as far as you can see. 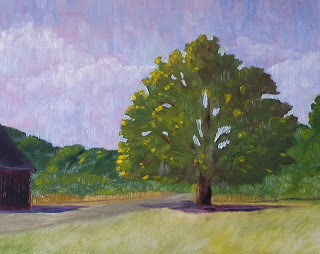 I've been tinkering around with this painting and several other tree paintings for the past few days. I keep tweaking the leaves and branches. I'm not sure that I'm finished, but this is where it stands now. It is a 6 x 8 inch painting on canvas panel. This little 5 x 7 oil painting on a gessoed hardboard panel is one I started quite some time ago and abandoned because it wasn't going where I wanted. 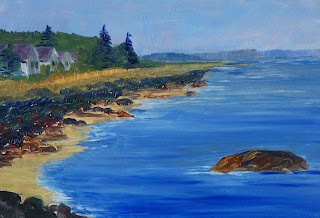 This morning I put it back on the easel and touched it up. I like it a much better now. These two trees are growing at the foot of a highway on ramp. The one on the left was unusually bent which is what drew me to paint them in the first place. Here is my work from yesterday, a 5 x 7 on hardboard. It has been raining for over a week now. Today is supposed to be the turning point for summer weather again. 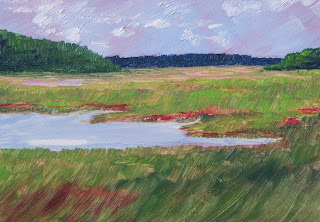 This little 5 x 7 study is from a photo I took before this current rain episode. I like it because it reminds me of the beauty of summer foliage and gives me something to look forward to after the rain moves on. 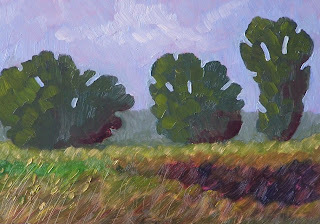 This 8 x 10 oil painting is focused on a field and a beautiful grove of trees. 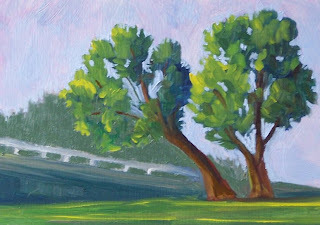 It is one more practice in my quest for the perfect tree painting. 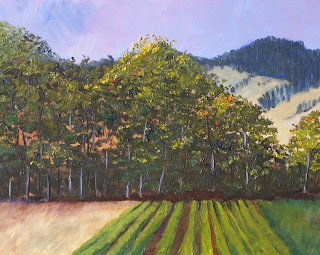 It was fun to paint and reminds me of the loveliness of summer vegetation. Yesterday it poured rain again. We're having a record-breaking summer. First we suffered through days of excessive heat, now were having day after day of record-breaking rain showers. It feels like winter again. 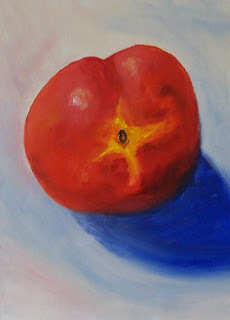 I guess that's why I am back to painting still life. My inspiration seems to change with the weather. 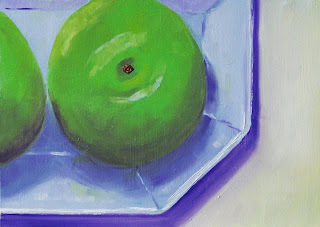 My effort yesterday was an apple on a Pottery Barn saucer. Painting the saucer was the most fun. It appears to be a simple stonewear saucer with a sienna colored edge, but that light colored plate had many more colors than one would first imagine--blue, yellow, violet, sienna, green. It was a delightful challenge. This painting is 8 x 10 on Gessoboard. I couldn't help it; I painted my lunch. Yesterday it rained and rained. Seattle broke a record for rain, so I was inside most of the day. This beautiful nectarine helped to remind me that it really is summer in spite of the wet weather. My backyard is full of these beautiful summer daisies. I couldn't resist bringing one in to paint. Putting it in a little medicine jar and setting it on my work table brought the sunshine into my studio. 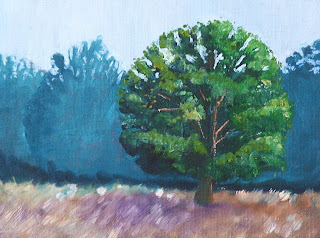 Today's tree practice is an 8 x 10 oil on canvas. 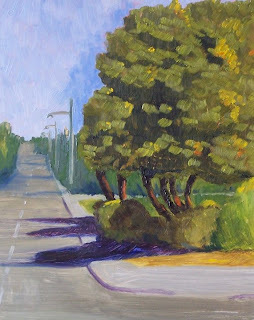 It was inspired by a tree in front of Alenmore Hospital in Tacoma, Washington. The weather was beautiful and the colors jumped at me as I drove by. I had to attempt to recreate this luscious tree that stood so proud in front of the hospital. 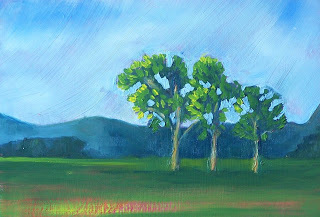 This little painting is reminiscent of a trip my family and I took last spring to Bellingham, Washington. The weather stormed almost all the way. The hills in the Skagit Valley were shrouded with fog and mist. Thinking of that cool weather trip is a relief during these hot days of summer. 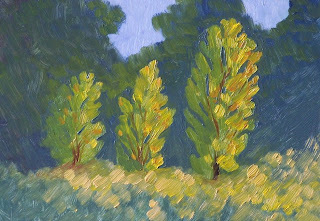 5 x 7 oil on Gessoboard This is a little practice of a scrub tree with brilliant orange leaves. I'm back to painting Ft. Steilacoom Park again. After leaving the barns and the old cemetary, there is a road that leads to Woghop Lake. It is a beautiful road flanked by huge trees. I love the way the sunlight flickers through the trees that act like an umbrella over the road. 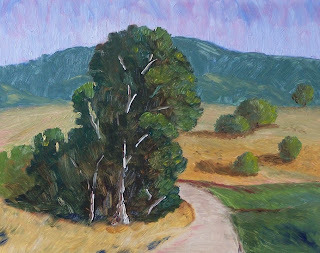 Although this painting only shows the road, there is a lake off to the left. 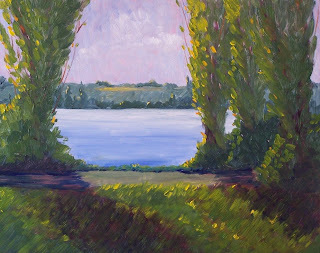 Perhaps tomorrow I will paint the lake. 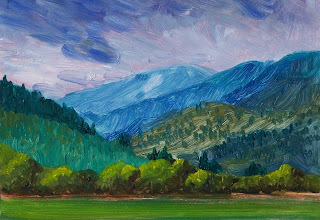 This one is 5 x 7 oil on Gessoboard. This little 5 x 7 painting is based on a view of several little beach cottages on the north shore of Gray's Harbor in Washington State. With temperatures soaring into the upper 90's today, this is where I'd like to be. 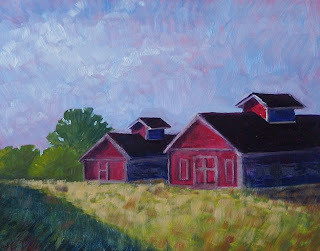 These barns are to the left of the tree I painted yesterday. They are what is left of the old work farm that used to be run by patients at Western State Hospital. 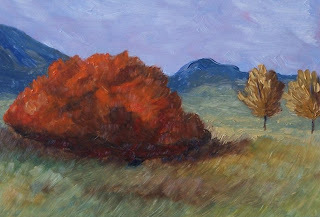 This painting is an 8 x 10 oil on Gessoboard. This is the final product of today's efforts. 8 x 10 oil on Gessoboard. This tree is on the edge of the Pioneer Cemetary at Ft. Steilacoom Park. The cemetary is just to the right. On the left is one of the barns that was used by the patients at the old Western State Hospital work farm. A rode runs between the tree and the barn. It is a lovely park. Last week was a very busy week, but I was able to squeeze in a little tree practice. My sister-in-law is the best cook ever. On the 4th of July, she gave me these orange beets. 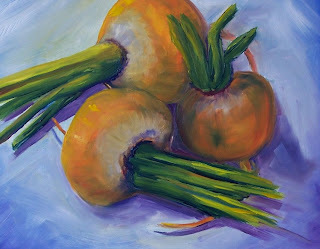 Who ever heard of "orange" beets? If there is anything gourmet, I can depend on her to find it. I wish she were here to cook them, too. 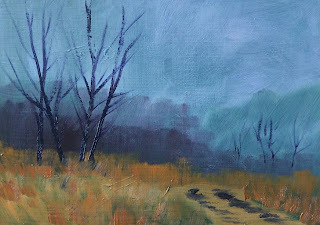 Although it is a little out of season, I enjoyed painting this foggy landscape this morning. 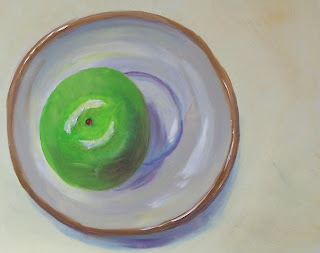 Here is the Pear on a Dish again. I couldn't leave it alone--added some final touches. 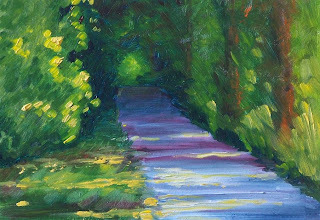 Still 5 x 7 oil on hardboard.